Since the Bundys beat the federal government in court, they have been searching for new ways to get their message out and expand their following. Ryan Bundy is running for the governor of Nevada in a long-shot bid to not just fight the government, but become the government. 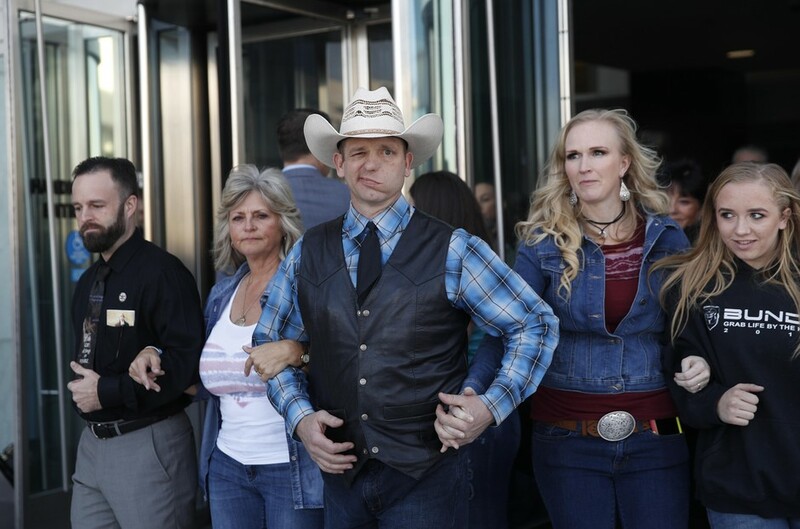 From left, Ryan Payne, Jeanette Finicum, widow of Robert “LaVoy” Finicum, Ryan Bundy, Angela Bundy, wife of Ryan Bundy and Jamie Bundy, daughter of Ryan Bundy, walk out of a federal courthouse, Dec. 20, 2017, in Las Vegas, Nevada. is a joint podcast by OPB and Longreads, hosted and reported by award-winning freelance journalist Leah Sottile. It is produced by Peter Frick-Wright and Robert Carver of 30 Minutes West Productions, and OPB’s Ryan Haas.